← Previous Previous post: Vale Paul Mees, 1961-2013. A great loss. It’s a great idea, especially for lobbying. It easily shows PT poor areas. I wasn’t sure on the colours – they just confused me. I’d rather one colour for < 5 mins, another for 5-10, 10-15, 15-20, etc. Thickness of lines has to be quite obvious to make a difference – for road maps, I still tend to go on the colours of roads as much as thickness to identify their type. It's also a sad indictment on our system that one service every 20 mins is considered "frequent" such that you don't need to look at a timetable. I also think it's just not true. If I rock up at a station and have just missed the service, I have to wait 20 mins – that's a long time and I probably could've driven halfway in that time (depending on where I'm going). Also, 20 min frequencies don't work if you have to connect to another service. If you just miss the 20-min bus and it doesn't connect well with the train (as is the case with most feeder buses in Melbourne), you end up waiting 30-40 mins, which is often more than your actual travelling time. I would prefer to see the map include 15 min frequencies only. If that means the train lines are left out, then so be it. It's a map about services that don't need timetable checking. Our train lines do. Let's be honest about it (and campaign for those frequency gaps to be filled). Also, the map doesn't take into account how long some of these trips take, so people will have to check timetables anyway. Some of the more frequent routes are also long ones. The 86 tram may come every 12 mins, but it takes an hour to get to it's terminus. The less frequent train + bus may be a better option overall – hence the inconvenience of the system returns. All this is a bit negative and I'm sorry about that. 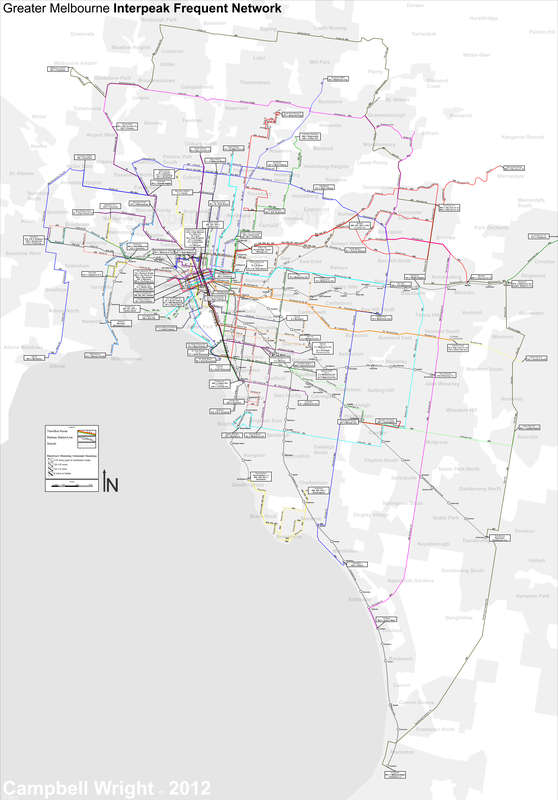 But at the end of the day, Melbourne simply doesn't have enough frequent services to make this map useful except for some privileged pockets of Melbourne. I think it would be excellent for lobbying and demonstrating that there are large parts of Melbourne with, practically, no useful access to PT. I guess I’m an old fashioned “timetable” person so wouldn’t find that map particularly useful in the middle suburbs. Also, some of the services mentioned don’t operate at night or on Sundays (eg 703 Brighton to Blackburn). PTV probably doesn’t want to make a map like the above for fear of political consequences, because it shows right then and there who gets good PT, and who doesn’t. This obviously causes headaches for whichever PT minister exists, and who wants that, right?! I like the look of the map but I also found the different colours more confusing than useful. While I think the large whole of Melbourne map is useful as an overview. It may be more useful for regular use if it was split into smaller maps of specific areas, thereby making it easier to see detail such as road names in the area that matters to you. 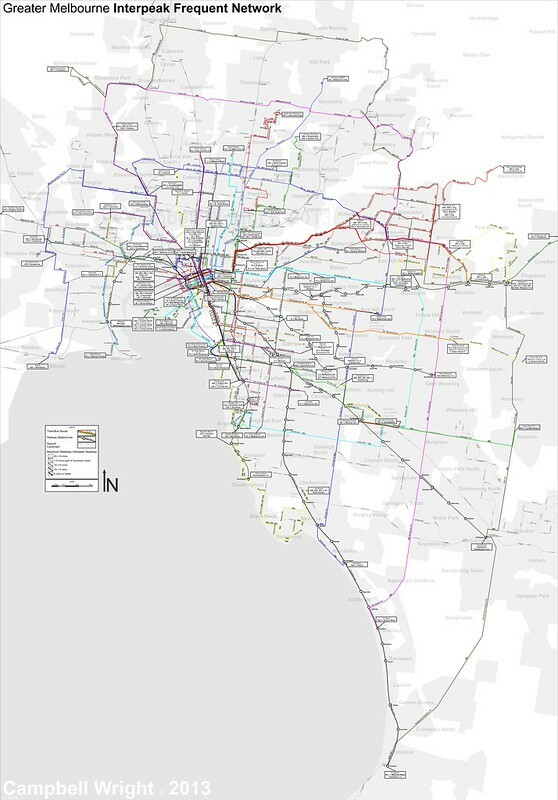 Since the PTV won’t publish the map maybe the PTUA should publish it on their web site and use it as a promotional tool? I agree with Daniel that all train lines should be shown. To many occasional PT users their local train line is the only PT they know about. As an example from my area on the Lilydale line almost everyone knows that they can get a train to Ringwood but few know that the 670 bus provides an alternative. Even I did not know till I looked at the map that it runs every 15 minutes and therefore is double the frequency of the train off peak. I would also like to see SmartBus links between train stations shown on Metro train maps as for example, many people thank that the fastest way to get from Lilydale to Dandenong on PT is to take the train to Richmond and back out to Dandenong but it is quicker and cheaper to take the 901. GREAT MAP, we need more of it. Great as been said, on a PT campaign point of view, BUT, it is more important as a public transport users guide too. I mean, the PTV, and their older variants right back to the PTV and even ‘The Met’ have always been cheap and nasty in the way of providing map detail for their customers to use. They never seem to care about promoting their services, and have never had a complete all in one travel guide for people like me to carry around with me. MY TIPS, As a travel guide, I would value what I can get printed out on my A3 printer, for me to use as a guide as I ‘travel about’. Therefore, perhaps you may need seven smaller maps, similar to the key maps in a Melways. At least four across Melbourne, and #5 to overlap around the city. ALSO, something like a road atlas of Australia, except, a public transport version. You know the one which has the train fares, map of tram and train networks, that should at least have the NightRider network included. Perhaps they should also have Smartbus network, and perhaps the regional V/Line map in this same publication too. At least there is a plan to increase the frequency of rail services to every 10 minutes except beyond Hurstbridge and Newport-Williamstown. I am a bit of a planner so I doubt the map of frequent services map is for me and phone apps like Offi and other apps make it so easy to see train, tram and bus times when it you are already out and about. Metro, which runs a non metro style service, spend promotional and advertising money in many ways, but oddly not on commercial tv. Turn up at the station and we guarantee you a train in ten minutes etc etc. I’d make the thicker lines thicker to make them more obvious, also there is plenty of room on the map. I’d also check that when where two or more routes run along the same route, that the thickness reflects the effective frequency (e.g. Maximum wait) not combined frequency (sum of frequency per hour from routes) as its darn frustrating when you get a frequency of 8 services an hour at 00, 02, 15, 17, 30, 32, 45, 47 which is really only 4 an hour. @Roger, step back a bit. How do you know that inner-city trams and trains offer frequent service, eg a viable alternative to driving? Yes, you’re right – buses are more patchy, but there are a number (mostly in inner-city areas) that are as good/useful as trams in terms of frequency and operating hours. How do people know where they are? @Chris, I think the idea of the multiple colours is to make clear the separate routes that might run along a common road for a bit then branch off. Good point about showing all railway lines – apart from them (mostly) providing a base level of fast/high-capacity service, they are the biggest PT landmark there is. Another thought in response to the above comments: in this day and age, the technology should be there to allow the user to customise the criteria to an extent, such as showing the frequent network available on the day of travel (eg weekdays there’s frequent Melb/Monash Uni shuttles, but these don’t run on weekends). The PTUA did a series of 15 minute maps back in 2006 (accompanying Age story) which were updated last year (accompanying Herald Sun story), showing frequent services in peak, inter-peak, weekends and evenings. This map is a very good start and it shows people from out of town how the transport lines in the city and surburbs are actually laid out which is much more useful to them than the not to scale route diagrams found on trams and trains. Most locals already know the scale of things and the not to scale diagrams are good enough for them. Since I travel between the CBD and St. Kilda most days I frequently give directions to visitors and I sometimes have to explain how the diagrams differ from the actual scale of the city, especially the route lines that are laid out strait line above the windows on trams. These just show some main stops along the route while omitting many others and dont really give “directions” to a specific place like a map does. As mentioned by others the map could easily be broken down to just show the area of the city needed and this would allow more detail to be added too such as colors and line thickness as well as all services available even if they are infrequent.. I would like to see a scaled map of stations based on minutes from the city using fastest peak inbound & outbound services. 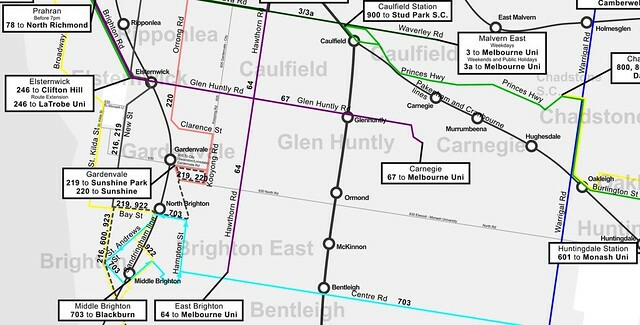 Eg, Cheltenham would be as close as Bentleigh, and Geelong a lot closer to Weribee. Minutes from the city is a key selling point for property, so let’s show it on a map. Padding of timetables, addition of express services would be reflected by such a map. It’s nice to have frequent trains, but for those that can understand a timetable, express trains at the peak hours are equally important. @Alasdair/@Marcus, the Human Transit blog looked at these types of maps a while back. The down side of them is they only look at travel speed/time, and are not very good at looking at frequency/wait time. What Alasdair’s asking for is really quite a bit different to the map in this post. This is about all-day frequent service; Alasdair is really asking about a map targeted at peak hour commutes. Such a map would be doubly interesting if it compared peak car travel times. @Boyd, you’re correct, I deliberately shrunk the original down a bit for posting, as I thought it was easier to read if it wasn’t quite so huge.